According to the Iowa Nutrient Reduction Strategy, Iowa farmers, municipalities, and others must reduce our nitrogen and phosphorus pollution by 45% if we are to move on from the present water quality crisis. While political stonewalling may be holding back our collective progress, the great news is that Iowans do not need to wait for government consensus to make progress on our own land. What follows are ten ways you can manage agricultural land and native ecosystems for clean water. Historic vegetation in northwest Iowa. 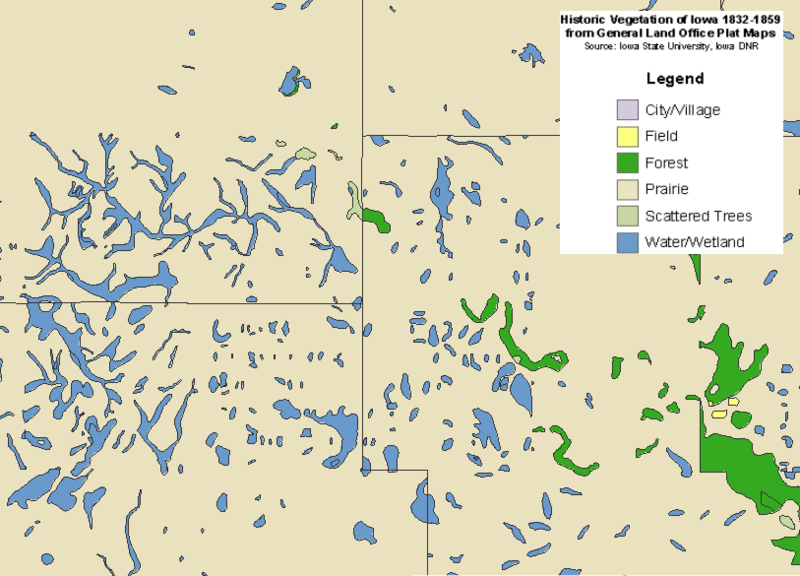 Get to know your land’s hydrological story for context clues about future management decisions. Learn about the historic vegetation that covered it in the mid-1800s (wetland, prairie, forest, savanna). Identify your location in a HUC-12 watershed. The land’s proximity to a waterway is often related to the path of water and speed at which it flows into it. Determine how water leaves your farm. How water flows off the landscape determines the most effective method to capture its nutrients. On sloped crop fields where water flows over the surface, converting just 10% of land to prairie STRIPS has been shown to reduce sediment erosion by 95%, nitrogen loss by 85%, and phosphorus loss by 90%. On land that is tile drained, water flowing through outlets can be diverted through a saturated buffer, which uses vegetation to filter out nearly all of the nitrogen. 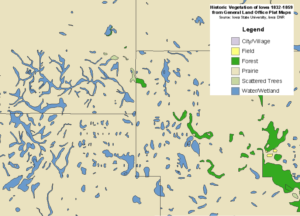 Where water pools in large depressions, unprofitable land can be restored to small prairie wetlands, which have a superb natural filtering capacity and valuable wildlife habitat. 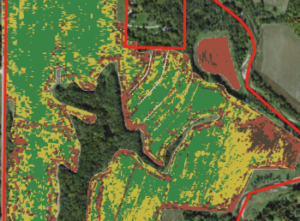 Yield monitor maps reveal less profitable areas that can be converted to native ecosystems. 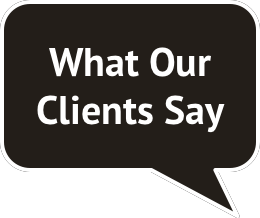 Review the last five years of yield monitor data and identify unprofitable areas. Use this data to determine the best places to re-establish perennial cover. Enroll in conservation programs through the Farm Service Agency (FSA) and Natural Resources Conservation Service (NRCS) to provide habitat for wildlife and improve water quality, as well as generate income from these acres. If well planned, enrollment in these programs can result in high value timber production over the long-term. Extend your crop rotation to include small grains and legumes. Iowa State University researcher Matt Liebman has shown that an extended rotation including oats and red clover or alfalfa can be just as profitable as a corn-beans rotation, while improving soil health and productivity. This is due to reduced input costs, increased yields, and resilience to insect and disease pressure and weather stress. Plant cover crops. These living roots cover your soil for several otherwise vacant months of the year (often September – May), holding in nutrients important for crop health, and preventing them from becoming pollutants. Cover crops also improve soil structure and nutrient cycling, helping your crops thrive for years to come. Tips for success: plan ahead and make sure that the cover crops you select fit well in your system. Take cover crops as seriously as your other crops, and consider grazing them, or chopping for ryelage ahead of a short-season corn or bean variety for an even greater immediate return. See Practical Farmers of Iowa’s Cover Crops page for information on integrating livestock with cover crops. 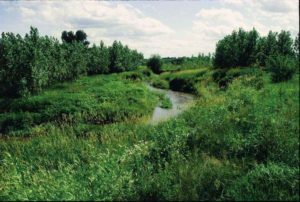 Stabilize stream banks with a riparian buffer of native trees and shrubs, and/or diverse prairie. Riparian buffers prevent stream bank erosion, which is a major cause of phosphorus pollution. Additionally, the dense vegetation helps filter nitrogen and other pollutants from over-land flow of water, and can also filter tile outlet water, if part of a saturated buffer. Riparian buffers create a phenomenal habitat for wildlife, landscape beauty, and recreation opportunities for people. Bring livestock out of the feedlot and back onto the land. When managed appropriately, nutrients that leave animals are not washed in to waterways as pollution, but are quickly captured by dense, living roots. Management Intensive Rotational Grazing creates healthy pastures that mimic native prairie in terms of nutrient losses. In contrast, grain-fed livestock support the annual crop-based system that is largely responsible for our water quality crisis. Why not use livestock to generate a larger market for perennial vegetation such as pastures, hay, and agroforestry, as well as cover crops and small grains. All of these practices result in living roots holding onto nutrients for more months of the year, in addition to better soil health and productivity, and fewer costly inputs. Connect with a community of innovative livestock farmers through Practical Farmers of Iowa. Manage your woodland for a healthy water cycle. Invasive species such as tartarian honeysuckle, autumn olive, and buckthorn can outcompete native species in a woodland, disrupting the natural canopy of diverse shrubs and dense groundcover. As the invasive species shade out the understory plants, the soil is left bare and susceptible to erosion (and phosphorus pollution). Have a forester take a look at your woodland to learn if the species and density are facilitating a healthy forest ecosystem. By managing your forest to prevent erosion, you are also managing for optimal wildlife habitat, aesthetics, and recreational opportunities. 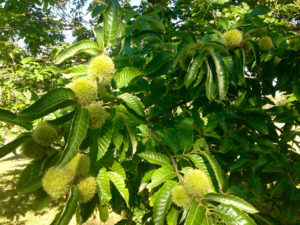 Chinese chestnuts are a perennial crop that can be grown to meet water quality and profitability goals. Seek out new opportunities to generate income from diverse perennials. High value timber, and specialty nuts, fruits, and ornamentals all have significant market potential. Different growing and marketing skills are required than for a typical crop or livestock farm, but perennials can be a great way to diversify your income streams. With creativity, you can even generate income from your land while perennials are taking root. Consider alley cropping with faster maturing crops or livestock, as well as agritourism and leased hunting. Learn more about diverse perennials at Red Fern Farm‘s website. Utilize passive water management to slow the flow of water, spread it over the landscape, and let it soak in. The principles of keyline design can help hold water on the landscape, direct the flow from overly-saturated to dry areas, and enable more water to be taken up and utilized by plants. Keyline design is a concept used widely in permaculture, and often used in livestock grazing and agroforestry systems. Keyline plowing (narrow but deep) is done on contour, or with a slight slope leading rainfall to flow toward dry areas on the landscape. Berms of soil may be formed on contour to enable the water to collect in the swales—the water catchment basins upslope of their upslope. Pocket ponds may also be installed to collect overflow water to utilize during dry times, and function as small wetlands that benefit wildlife and water filtration. Recommended technical manual: Rainwater Harvesting for Drylands and Beyond: Volume 2: Water-Harvesting Earthworks, by Brad Lancaster. 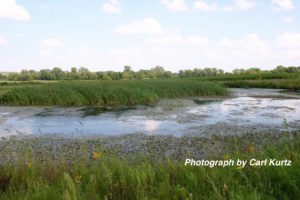 Reconstructed wetlands filter water, and convert unprofitable farmland into valuable wildlife habitat. Managing for clean water is simply managing for a healthy ecosystem—productive soil, profitable farms, and high quality habitat for wildlife. We do not need to wait for our state government to take action—start now, because farming for improved water quality could make you more profit, and protect and improve your land for future generations.